Each year, the NAVC Institute gathers the top specialists in select areas of veterinary medicine to provide hands-on, one-on-one continuing education to the Institute attendees. This article reviews information from the session, Canine Sports Medicine & Rehabilitation, presented at the NAVC Institute 2015. The NAVC Institute 2017 takes place in Orlando, Florida, May 21 to 26; visit navc.com/institute for further information. While some tissues can heal to their original or near-original strength and stiffness, other tissues, such as cartilage, heal poorly. Regenerative medicine has been used to stimulate healing in areas that have not responded to more traditional approaches, helping injured tissues heal to their original or near-original condition. Platelets play roles in both hemostasis and wound healing, and PRP has been used as a regenerative medicine therapy to aid in tissue healing. PRP therapy is a minimally invasive procedure that typically can be performed on an outpatient basis. It is often performed as a series of 1 to 3 injections, with 2 weeks between each injection. If PRP is being used to manage moderate to severe osteoarthritis, in my experience, about 50% of dogs require more than 1 injection for significant improvement. Approximately 30 to 60 mL of blood is obtained using an 18-gauge needle or butterfly needle, processed, and prepared for injection (Figures 1 and 2). FIGURE 1. Blood collected for platelet-rich plasma (PRP) processing using an 18-gauge butterfly needle and syringe. Most systems require 10 to 60 mL of blood for PRP processing. FIGURE 2. 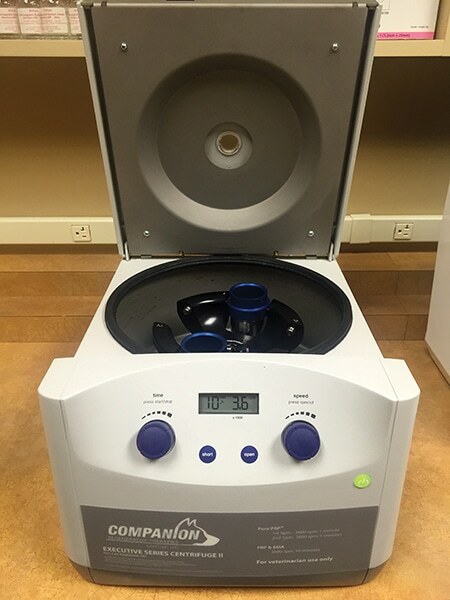 Both centrifugation and filtration systems are available for PRP processing. 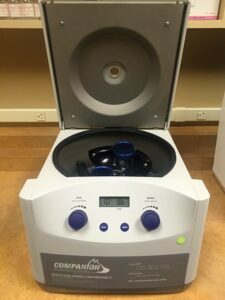 This centrifugation PRP system used for processing produces a leukocyte- and erythrocyte-poor PRP sample. Once the PRP is processed, the area to be treated is clipped and aseptically prepared. Sedation or general anesthesia may be required for injection, depending on the location of the injection. For osteoarthritis, PRP joint injections are usually performed without sedation; however, some joints, such as the hip, require sedation and may also require advanced imaging (fluoroscopy) for guidance. If one is not familiar with joint injections, it is wise to sedate patients until comfort with the procedure is obtained. PRP has been used for tendon and ligament injuries, and is most commonly used for low grade strains or sprains. For soft tissue injuries, ultrasonography guidance is used to ensure accuracy of the injection because PRP is most effective when administered directly into the lesion. If musculoskeletal ultrasound is not available for obtaining a definitive diagnosis or guidance for treatment administration, referral should be considered. Ultrasound-guided injections also require sedation. A dedicated rehabilitation therapy program is often recommended in conjunction with PRP therapy to achieve and maintain the fullest musculoskeletal potential and performance level. Since the effects of certain modalities on PRP have not been well documented, therapeutic ultrasound, electrostimulation, and hydrotherapy are not recommended during the 4 weeks following PRP therapy. Recent studies have demonstrated the efficacy of stem cell therapy for canine osteoarthritis.62-64 While many factors play a role in the decision to choose stem cell therapy for a patient, in our experience, patients with severe to end-stage osteoarthritis typically respond better to a combination of stem cell and PRP therapy rather than PRP therapy alone. Stem cells that can be obtained from the patient’s own body are called autologous adult-derived MSCs. The most common places from which to harvest adult-derived MSCs are the patient’s bone marrow or adipose tissue (Figures 3 and 4). Both bone marrow-derived and adipose-derived stem cells can differentiate into cartilage, bone, tendons, and ligaments. To date, no evidence supports superiority of one over the other in terms of viability or efficacy of the derived stem cells. However, adipose tissue may be a preferred source in dogs (see Adipose-Derived Stem Cells). FIGURE 3. Bone marrow collection (A) from the proximal femur with fluoroscopic guidance (B) for processing of bone marrow aspirate concentrate (BMAC). FIGURE 4. Collection of adipose tissue from the falciform ligament for processing of stromal vascular fraction (SVF). Almost all veterinary research has focused on adult stem cells, specifically MSCs, derived from bone marrow (BM-MSCs) or adipose tissue. Adipose tissue may be a preferred source in dogs for several reasons, including ease of access, low morbidity and pain associated with collection, and high-yielding MSC count (especially falciform) (Figure 4). The cells isolated from the adipose tissue include not only the MSCs but also endothelial progenitor cells, pericytes, immune cells, fibroblasts, and other growth factor-secreting bioactive cells. The use of this combination of stem cells and other regenerative cells is known as SVF therapy, and this mixture can be injected directly into the injured tissue or joint or can be administered by IV route. However, recent studies have shown that stem cells given by IV do not actually reach joints or injured tissues72; thus, for orthopedic applications, we currently do not recommend administering stem cells IV. Alternatively, stem cells can be isolated from adipose tissue, cultured, and expanded. This technique, which yields a more homogenous population with a larger quantity of cells for injection, is known as adipose-derived cultured progenitor cell, or ADPC, therapy. To date, no studies show superiority of adipose-derived SVF versus culture-expanded adipose-derived MSCs for treatment of canine orthopedic conditions. BM-MSCs are most commonly used in equine regenerative medicine but can also be used in dogs. 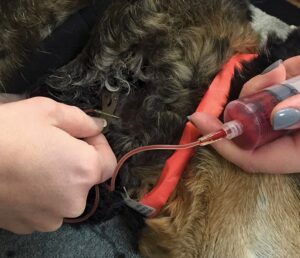 There are 2 primary techniques for canine BM-MSC therapy: bone marrow aspirate concentrate (BMAC) and cultured-expanded. The cells can be processed quickly for faster therapeutic application. Processing takes only 1 to 2 hours if it can be performed in-house by using a commercially available kit, which allows the practitioner to initiate therapy 3 to 4 weeks earlier than can be done with culture-expanded cells. These cells are not manipulated in culture to the extent that culture-expanded cells are, meaning that they do not undergo adherence, expansion, or trypsinization through multiple passages, which can alter cellular phenotype. This cellular therapy also delivers portions of the bone marrow cell pool that could potentially participate in tissue regeneration. Alternatively, BM-MSCs can be isolated, cultured, and expanded. This yields a more homogenous population with a larger quantity of cells for injection. To date, no studies show superiority of BMAC over culture-expanded BM-MSCs in the treatment of canine orthopedic conditions. In addition, no studies have documented the superiority of BM-MSCs over adipose-derived stem cells or identified the number of stem cells needed for treating soft tissue injuries or osteoarthritis. Injection of PRP or stem cells is a minimally invasive procedure that typically can be performed on an outpatient basis. Sedation or general anesthesia may be required, depending on the location of the injection; sedation is required for injections administered under ultrasound guidance. Joint injections are usually performed without sedation; however, some joints, such as the hip, require sedation and may also require advanced imaging (fluoroscopy) for guidance. If one is not familiar with joint injections, it is wise to sedate patients until comfort with the procedure is obtained. For soft tissue injuries, ultrasonography guidance ensures accuracy of the injection because both PRP and stem cells are most effective when administered directly into the site of injury (Figure 5). The most common side effect is mild discomfort associated with the injection, which typically resolves within 12 to 24 hours. FIGURE 5. Ultrasonography-guided injection of BMAC and PRP into the supraspinatus tendon. The green arrow points to the needle being inserted into the supraspinatus tendon. A dedicated rehabilitation therapy program guided by trained and certified individuals in canine rehabilitation is often recommended for 12 weeks after regenerative medicine therapy, depending on the diagnosed condition. Rehabilitation therapy should be performed weekly in conjunction with an at-home exercise program. Certain therapies are contraindicated within the first 8 weeks of regenerative medicine therapy because their effects on stem cells and PRP have not been fully studied; these therapies include class IV low-level laser therapy, therapeutic ultrasound, shockwave therapy, neuromuscular electrical stimulation/transcutaneous electrical neurostimulation, and nonsteroidal anti-inflammatory drugs. Underwater treadmill therapy can usually be initiated 8 weeks after the start of rehabilitation therapy. Once the tissue has healed, as confirmed via orthopedic examination, gait analysis, and diagnostic ultrasonography or needle arthroscopy, the rehabilitation program focuses on strengthening and conditioning. After appropriate muscle mass has been attained, dogs are cleared for retraining and return to sport. On average, patients treated with regenerative medicine therapy typically return to competition or normal activity within 4 to 6 months of treatment. Regenerative medicine has been used to stimulate healing and help restore injured tissues to their original or near-original condition. Canine regenerative medicine therapy can be used to help treat medial shoulder syndrome, shoulder tendinopathies (eg, supraspinatus tendinopathy or biceps tendinopathy), iliopsoas strain, Achilles tendon injury, early partial cranial cruciate ligament tear, carpal and tarsal ligament injuries, and osteoarthritis. It is important to obtain a definitive diagnosis and ensure that the patient is an appropriate candidate for regenerative medicine. It is equally important to incorporate a dedicated rehabilitation therapy plan into the recovery process to optimize results from regenerative medicine therapy. Filardo G, Kon E, Roffi A, et al. Platelet rich plasma: Why intra-articular? A systematic review of preclinical studies and clinical evidence on PRP for joint degeneration. Knee Surg Sports Traumatol Arthrosc 2015; 23(9):2459-2474. Hsu WK, Mishra A, Rodeo SR, et al. Platelet-rich plasma in orthopaedic applications: Evidence-based recommendations for treatment. J Am Acad Orthop Surg 2013; 21:739-748. Abrams GD, Frank RM, Fortier LA, Cole BJ. Platelet-rich plasma for articular cartilage repair. Sports Med Arthrosc Rev 2013; 21:213-219. Cho K, Kim JM, Kim MH, et al. Scintigraphic evaluation of osseointegrative response around calcium phosphate-coated titanium implants in tibia bone: Effect of platelet-rich plasma on bone healing in dogs. Eur Surg Res 2013; 51:138-145. Dragoo JL, Wasterlain AS, Braun HJ, Nead KT. Platelet-rich plasma as a treatment for patellar tendinopathy: A double-blind, randomized controlled trial. Am J Sports Med 2014; 42(3):610-618. Filardo G, Kon E, Di Martino A, et al. Platelet-rich plasma vs hyaluronic acid to treat knee degenerative pathology: Study design and preliminary results of a randomized controlled trial. BMC Musculoskelet Disord 2012; 13(229):1-8. Khoshbin A, Leroux T, Wasserstein D, et al. The efficacy of platelet-rich plasma in the treatment of symptomatic knee osteoarthritis: A systematic review with quantitative synthesis. 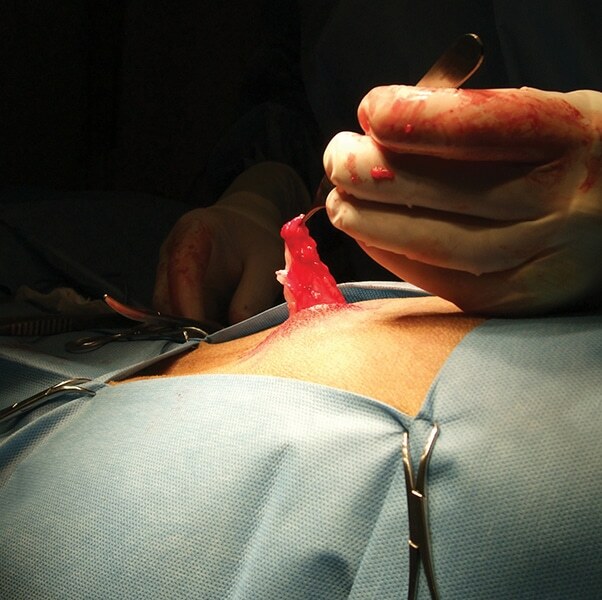 Arthroscopy 2013; 29(12):2037-2048. Randelli P, Arrigoni P, Ragone V, et al. Platelet rich plasma in arthroscopic rotator cuff repair: A prospective RCT study, 2-year follow-up. J Shoulder Elbow Surg 2011; 20:518-528. Kristjansson B, Honsawek S. Current perspectives in mesenchymal stem cell therapies for osteoarthritis. Stem Cells Int 2014:1-13. Mazor M, Lespessailles E, Coursier R, et al. Mesenchymal stem-cell potential in cartilage repair: An update. J Cell Mol Med 2014; 18(12):2340-2350. Sampson S, Batto-van Bemden A, Aufiero D. Stem cell therapies for treatment of cartilage and bone disorders: Osteoarthritis, avascular necrosis, and non-union fractures. PMR 2015; 7:S26-S32. Vilar JM, Batista M, Morales M, et al. Assessment of the effect of intraarticular injection of autologous adipose derived mesenchymal stem cells in osteoarthritic dogs using a double blinded force platform analysis. BMC Vet Res 2014; 10:143. Boswell SG, Cole BJ, Sundman EA, et al. Platelet-rich plasma: A milieu of bioactive factors. Arthroscopy 2012; 28(3):429-439. Dohan Ehrenfest DM, Doglioli P, de Peppo GM, et al. Choukroun’s platelet-rich fibrin (PRF) stimulates in vitro proliferation and differentiation of human oral bone mesenchymal stem cell in a dose-dependent way. Arch Oral Biol 2010; 55:185-194. McLellan J, Plevin S. Does it matter which platelet-rich plasma we use? Equine Vet Educ 2011; 23(2):101-104. Pelletier MH, Malhotra A, Brighton T, et al. Platelet function and constituents of platelet rich plasma. Int J Sports Med 2013; 34:74-80. Sundman EA, Cole BJ, Karas V, et al. The anti-inflammatory and matrix restorative mechanisms of platelet-rich plasma in osteoarthritis. Am J Sports Med 2013; 42(1):35-41. Dragoo JL, Braun HJ, Durham JL, et al. Comparison of the acute inflammatory response of two commercial platelet-rich plasma systems in healthy rabbit tendons. Am J Sports Med 2012; 40(6):1274-1281. Filardo G, Kon E, Buda R, et al. Platelet-rich plasma intra-articular knee injections for the treatment of degenerative cartilage lesions and osteoarthritis. Knee Surg Sports Traumatol Arthrosc 2011; 19:528-535. Franklin S, Cook J. Prospective trial of autologous conditioned plasma versus hyaluronan plus corticosteroid for elbow osteoarthritis in dogs. Can Vet J 2013; 54:881-884. Jang SJ, Kim JD, Cha SS. Platelet-rich plasma (PRP) injections as an effective treatment for early osteoarthritis. Eur J Orthop Surg Traumatol 2013; 23:573-580. Kon E, Buda R, Filardo G, et al. Platelet-rich plasma: Intra-articular knee injections produced favorable results on degenerative cartilage lesions. Knee Surg Sports Traumatol Arthrosc 2010; 18:474-479. Kon E, Mandelbaum B, Buda R, et al. Platelet-rich plasma intra-articular injection versus hyaluronic acid viscosupplementation as treatments for cartilage pathology: From early degeneration to osteoarthritis. Arthroscopy 2011; 27(11):1490-1501. McCarrel T, Fortier L. Temporal growth factor release from platelet-rich plasma, trehalose lyophilized platelets, and bone marrow aspirate and their effect on tendon and ligament gene expression. J Orthop Res 2009; 27(8):1033-1042. McCarrel TM, Minas T, Fortier LA. Optimization of leukocyte concentration in platelet-rich plasma for the treatment of tendinopathy. J Bone Joint Surg Am 2012; 94:e143(1-8). Mishra A, Pavelko T. Treatment of chronic elbow tendinosis with buffered platelet-rich plasma. Am J Sports Med 2006; 34(11):1774-1778. Patel S, Shillon MS, Aggarwal S, et al. Treatment with platelet-rich plasma is more effective than placebo for knee osteoarthritis: A prospective, double-blinded, randomized trial. Am J Sports Med 2013; 41(2):356-364. Raeissadat SA, Rayegani SM, Babaee M, Ghorbani E. The effect of platelet-rich plasma on pain, function, and quality of life of patients with knee osteoarthritis. Pain Res Treat 2013; 1:1-7. Sampson S, Gerhardt M, Mandelbaum B. Platelet rich plasma injection grafts for musculoskeletal injuries: A review. Curr Rev Musculoskelet Med 2008; 1:165-174. Silva RF, Carmona JU, Rezende CMF. Intra-articular injections of autologous platelet concentrates in dogs with surgical reparation of cranial cruciate ligament rupture. Vet Comp Orthop Traumatol 2013; 26:122-125. Smith JJ, Ross MW, Smith RKW. Anabolic effects of acellular bone marrow, platelet rich plasma, and serum on equine suspensory ligament fibroblasts in vitro. Vet Comp Orthop Traumatol 2006; 19:43-47. Souza TFB, Andrade AL, Ferrreira GTNM, et al. Healing and expression of growth factors (TGF-B and PDGF) in canine radial osteotomy gap containing platelet-rich plasma. Vet Comp Orthop Traumatol 2012; 25:445-452. Van Buul GM, Koevoet WLM, Kops N, et al. Platelet-rich plasma releasate inhibits inflammatory processes in osteoarthritic chondrocytes. Am J Sports Med 2011; 39(11):2362-2370. Xie X, Hua W, Zhao S, et al. The effect of platelet-rich plasma on patterns of gene expression in a dog model of anterior cruciate ligament reconstruction. J Surg Res 2013; 180:80-88. Xie X, Wang Y, Zhao C, et al. Comparative evaluation of MSCs from bone marrow and adipose tissue seeded in PRP-derived scaffold for cartilage regeneration. Biomaterials 2012; 33:7008-7018. Cook JL, Smith PA, Bozynski CC, et al. Multiple injections of leukoreduced platelet rich plasma reduce pain and functional impairment in a canine model of ACL and meniscal deficiency. J Orthop Res 2015; 1-9. Broeckx S, Zimmerman M, Crocetti S, et al. Regenerative therapies for equine degenerative joint disease: A preliminary study. PloS One 2014; 9(1):e85917. Cho HS, Song IH, Park SY, et al. Individual variation in growth factor concentrations in platelet-rich plasma and its influence on human mesenchymal stem cells. Korean J Lab Med 2011; 31:212-218. Del Bue M, Riccò S, Ramoni R, et al. Equine adipose-tissue derived mesenchymal stem cells and platelet concentrates: Their association in vitro and in vivo. Vet Res Commun 2008; 32(S1):S51- S55. Drengk A, Zapf A, Stürmer EK, et al. Influence of platelet-rich plasma on chondrogenic differentiation and proliferation of chondrocytes and mesenchymal stem cells. Cells Tissues Organs 2009; 189:317-326. Dohan Ehrenfest DM, Rasmusson L, Albrektsson T. Classification of platelet concentrates: From pure platelet-rich plasma (P-PRP) to leukocyte- and platelet-rich fibrin (L-PRF). Trends Biotech 2008; 27(3):158-167. Mishra A, Tummala P, King A, et al. Buffered platelet-rich plasma enhances mesenchymal stem cell proliferation and chondrogenic differentiation. Tissue Eng Part C Methods 2009; 15:431-435. Schnabel LV, Lynch ME, Van der Meulen MC, et al. Mesenchymal stem cells and insulin-like growth factor-I gene-enhanced mesenchymal stem cells improve structural aspects of healing in equine flexor digitorum superficialis tendons. J Orthop Res 2009; 27(10):1392-1398. Torricelli P, Fini M, Filardo G, et al. Regenerative medicine for the treatment of musculoskeletal overuse injuries in competition horses. Internat Orthop 2011; 35:1569-1576. Braun HJ, Kim HJ, Chu CR, Dragoo JL. The effect of platelet-rich plasma formulations and blood products on human synoviocytes. Am J Sports Med 2014; 42(5):1204-1210. Sundman EA, Cole BJ, Fortier LA. Growth factor and catabolic cytokine concentrations are influenced by the cellular composition of platelet-rich plasma. Am J Sports Med 2013; 39(10):2135-2140. Sundman EA, Boswell SG, Schnabel LV, et al. Increasing platelet concentrations in leukocyte-reduced platelet-rich plasma decrease collagen gene synthesis in tendons. Am J Sports Med 2013; 42(1):35-41. Castillo TN, Pouliot MA, Kim HJ, Dragoo JL. Comparison of growth factor and platelet concentrations from commercial platelet-rich plasma separation systems. Am J Sports Med 2011; 39(2):266-271. Stief M, Gottschalk J, Ionita JC, et al. Concentration of platelets and growth factors in canine autologous conditioned plasma. Vet Comp Orthop Traumatol 2011; 24:285-290. Boswell SG, Schnabel LV, Mohammed HO, et al. Increasing platelet concentrations in leukocyte-reduced platelet-rich plasma decrease collagen gene synthesis in tendons. Am J Sports Med 2013; 42(1):42-49. Cavallo C, Filardo G, Mariani E, et al. Comparison of platelet-rich plasma formulations for cartilage healing. J Bone Joint Surg Am 2014; 96:423-429. Naldini A, Morena E, Fimiani M, et al. The effects of autologous platelet gel on inflammatory cytokine response in human peripheral blood mononuclear cells. Platelets 2008; 19(4):268-274. Yoshida R, Murray MM. Peripheral blood mononuclear cells enhance the anabolic effects of platelet-rich plasma on anterior cruciate ligament fibroblasts. J Orthop Res 2013; 31(1):29-34. Franklin SP, Garner BC, Cook JL. Characteristics of canine platelet-rich plasma prepared with five commercially available systems. Am J Vet Res 2015; 76(9):822-827. Carr BJ, Canapp SO, Mason DM, et al. Canine platelet rich plasma systems: A multicenter, prospective analysis. Front Vet Sci 2015; 2:73. Schippinger G, Pruller F, Divjak M, et al. Autologous platelet-rich plasma preparations: Influence of nonsteroidal anti-inflammatory drugs on platelet function. Orthop J of Sports Med 2015; 3(6):1-6. Grassel S, Lorenz J. Tissue engineering strategies to repair chondral and osteochondral tissue in osteoarthritis: Use of mesenchymal stem cells. Curr Rheumatol Rep 2014; 16:452. Ham O, Lee CY, Kim R, et al. Therapeutic potential of differentiated mesenchymal stem cells for treatment of osteoarthritis. Int J Mol Sci 2015; 16:14961-14978. Wang W, Cao W. Treatment of osteoarthritis with mesenchymal stem cells. Sci China Life Sci 2014; 57(6):586-595. Wolfstadt JI, Cole BJ, Ogilvie-Harris DJ, et al. Current concepts: The role of mesenchymal stem cells in the management of knee osteoarthritis. Sports Health 2015; 7(1):38-44. Kiefer K, Wucherer KL, Pluhar GE, Conzemius MG. Autologous and allogeneic stem cells as adjuvant therapy for osteoarthritis caused by spontaneous fragmented coronoid process in dogs. VOS Symposium Proc, 2013. Vilar JM, Morales M, Santana A, et al. Controlled, blinded force platform analysis of the effect of intraarticular injection of autologous adipose-derived mesenchymal stem cells associated to PRGF-Endoret in osteoarthritic dogs. BMC Vet Res 2013; 9:131. Case JB, Palmer R, Valdes-Martinez A, et al. Gastrocnemius tendon strain in a dog treated with autologous mesenchymal stem cells and a custom orthosis. Vet Surg 2013; 42:355-360. Martinello T, Bronzini I, Maccatrozzo L, et al. Canine adipose-derived-mesenchymal stem cells do not lose stem features after a long-term cryopreservation. Res Vet Sci 2011; 91:18-24. Carvalho AM, Badial PR, Alvarez LE, et al. Equine tendonitis therapy using mesenchymal stem cells and platelet concentrations: A randomized controlled trial. Stem Cell Res Ther 2013; 22(4):85. Chen L, Dong SW, Liu JP, et al. Synergy of tendon stem cells and platelet-rich-plasma in tendon healing. J Orthop Res 2012; 30(6):991-997. Uysal CA, Tobita M, Hyakusoku H, Mizuno H. Adipose-derived stem cells enhance primary tendon repair: Biomechanical and immunohistochemical evaluation. J Plast Reconstr Aesthet Surg 2012; 65(12):1712-1719. Manning CN, Schwartz AG, Liu W, et al. Controlled delivery of mesenchymal stem cells and growth factors using a nanofiber scaffold for tendon repair. Acta Biomater 2013; 9(6):6905-6914. Yun JH, Han SH, Choi SH, et al. Effects of bone marrow-derived mesenchymal stem cells and platelet-rich plasma on bone regeneration for osseointegration of dental implants: Preliminary study in canine three-wall intrabony defects. J Biomed Mater Res B Appl Biomater 2014; 102(5):1021-1030. Tobita M, Uysal CA, Guo X, et al. Periodontal tissue regeneration by combined implantation of adipose tissue-derived stem cells and platelet-rich plasma in a canine model. Cryotherapy 2013; 15(12):1517-1526. Harting MT, Jimenez F, Xue H, et al. Intravenous mesenchymal stem cell therapy for traumatic brain injury. J Neurosurg 2009; 110(6):1189-1197. Ginani F, Soares DM, Barreto MP, Barboza CA. Effect of low-level laser therapy on mesenchymal stem cell proliferation: A systemic review. Lasers Med Sci 2015; 30(8):2189-2194. Brittany Jean Carr, DVM, CCRT, is a rehabilitation therapist and American College of Veterinary Sports Medicine and Rehabilitation resident at Veterinary Orthopedic & Sports Medicine Group (VOSM) in Annapolis Junction, Maryland. She received her DVM from Virginia–Maryland College of Veterinary Medicine (Virginia Institute of Technology), and completed a small animal rotating internship at the Animal Specialty Group in Los Angeles, California, and a surgical internship at VOSM. Sherman O. Canapp, DVM, MS, CCRT, Diplomate ACVS & ACVSMR, is co-principal and chief of staff at Veterinary Orthopedic & Sports Medicine Group (VOSM) in Annapolis Junction, Maryland. Dr. Canapp is president and CEO of Orthobiologic Innovations, LLC. He publishes and presents at national and international conferences and continuing education seminars on osteoarthritis, sports medicine, rehabilitation therapy, regenerative medicine, and minimally invasive surgery. He received his DVM and MS in surgery from Kansas State University.